The Arab American Museum in Detroit produced a contributory multimedia exhibition called Connecting Communities in which visitors were encouraged to share their own immigration stories and listen to others’ via mobile phone. A consortium of five Chicago-based cultural museums hosted community dialogues about the unique challenges and experiences of Cambodian, Polish, Swedish, and Japanese immigration groups. Angel Island State Park in San Francisco launched discussion-oriented tours in which visitors grappled with complex issues of immigration policy by exploring poetry carved on the walls of the detention center by historic inmates. The Japanese American National Museum in Los Angeles offered dialogue-based tours for high school students that encouraged teenagers to discuss their reactions to cultural stereotypes and discrimination. There’s no single approach to making a cultural institution more participatory. Each of these institutions initiated a project to stimulate conversation about immigration in a way that fit with its mission and resources. How can you choose the model that will work best for your institution or project? To do so, you need to understand the potential structures for participation, and then find the approach that best supports your institutional mission and goals. The first step in developing a participatory project is to consider the range of ways visitors might participate with institutions. A participant who writes her reaction to a performance on an index card is very different from one who donates her own personal effects to be part of an exhibit. Both these visitors are different from a third type who helps staff develop a new program from scratch. How can we describe the ways visitors participate with formal institutions? This was the question that Rick Bonney and a team of educators and science researchers at the Center for Advancement of Informal Science Education (CAISE) tackled in the Public Participation in Scientific Research (PPSR) project. As far back as the 1880s, scientists have led “citizen science” projects in which amateurs are invited to participate in formal scientific research by volunteering to count birds, measure soil quality, or document non-native plant species. Despite its long history, few researchers studied the use and impact of citizen science until the 1980s. In 1983 Rick Bonney joined the staff at the Cornell Lab of Ornithology and co-founded its Citizen Science program, the first program to professionalize the growing participatory practice. Over the course of several projects at the Lab, Bonney noted that different kinds of participation led to different outcomes for participants. In 2008, he led the PPSR team in a study to construct a typology of public participation to better understand the differences among project types. The PPSR report defined three broad categories of public participation in scientific research: contribution, collaboration, and co-creation. These categories align roughly with the extent to which the public are involved in different stages of scientific research. In contributory projects, participants collect data in a scientist-controlled process. Scientists design the test questions, steer the data collection, and analyze the results. In collaborative projects, citizens collect data, but they also analyze results and draw conclusions in partnership with the scientists. In co-creative projects, the public develops the test questions, and scientists co-produce scientific regimens to address the community interest. Most citizen science projects are contributory. These are the easiest projects for scientists to manage because they involve limited and specific participatory engagement. Contributors count birds, measure soil acidity, and perform other well-defined data collection activities. The PPSR report concluded that contributory citizen science projects are enormously successful at engaging the public with science content and activities but rarely connect participants to the entire scientific process. Collaborative and co-creative projects help participants develop broader scientific research skills. Participants are actively engaged not just in scientific inquiry and observation but also in the analysis and development of research methodology. When participants analyze data themselves, their eagerness and ability to share scientific results with their own communities increases. The PPSR report also documented that co-created projects, when structured around a topic of community concern, like localized pollution, drew “concerned citizens into the scientific process who would not otherwise be involved with science-related activities.” By applying scientific techniques to a community need, staff members were able to connect nontraditional audiences more meaningfully with science. In contributory projects, visitors are solicited to provide limited and specified objects, actions, or ideas to an institutionally controlled process. Comment boards and story-sharing kiosks are both common platforms for contributory activities. In collaborative projects, visitors are invited to serve as active partners in the creation of institutional projects that are originated and ultimately controlled by the institution. Top 40 and Click! (Chapter 3) were both collaborative projects in which visitors’ choices shaped the design and content of resulting exhibitions. In co-creative projects, community members work together with institutional staff members from the beginning to define the project’s goals and to generate the program or exhibit based on community interests. The Glasgow Open Museum (Chapter 4) is an excellent example of a co-created institution. The staff partners with visitors to co-produce exhibits and programs based on community members’ interests and the institution’s collections. I add a fourth model to the PPSR typology: hosted. Hosted projects are ones in which the institution turns over a portion of its facilities and/or resources to present programs developed and implemented by public groups or casual visitors. This happens in both scientific and cultural institutions. Institutions share space and/or tools with community groups with a wide range of interests, from amateur astronomers to knitters. Online, programmers may use cultural object registries or scientific data as the basis for their own research or products. Game enthusiasts may use the grounds of an institution as a giant game board for imaginative play. Hosted projects allow participants to use institutions to satisfy their own needs with minimal institutional involvement. These participatory models are distinct, but many institutions incorporate elements from each of them. When staff members embrace visitor participation in earnest, they frequently move fluidly from one model to another, using different approaches for different projects and community relationships. For example, an art museum may host a late night program geared at creative professionals. At such events, the museum might invite attendees to contribute to community art projects. Staff might partner with outside artists in collaboration to present various components of the event, and if participants become deeply engaged, staff members may even invite them to lead their own projects or events in partnership with the museum, effectively co-creating new programs together. Contribution, collaboration, co-creation, hosted. No one model is better than the others. Nor should they even be seen as progressive steps towards a model of “maximal participation.” Consider the difference between a project in which a museum sources exhibit material from visitors (contributory) and one in which the institution works with a small group of outsiders to develop an exhibit (collaborative). If the first project results in an exhibit made entirely of visitors’ creations and voices and the second results in an exhibit that looks more like a “typical” exhibit, which project is more participatory? Which is more participatory: making art or doing research? Developing exhibits or using them to remix new media products? There is no “best” type of participation in cultural institutions. The differences among participatory project types are highly correlated with the amount of ownership, control of process, and creative output given to institutional staff members and visitors. Not every project benefits from the same power structure. Institutional culture helps determine how much trust and responsibility the staff will grant to community members, and forcing an organization into an uncomfortable model rarely succeeds. Some contributory projects provide too few engaging experiences to attract any participation, and some co-created projects go far beyond what institutions desire or value in the outcomes they produce. Which models of engagement will be most valuable for different projects or institutions? The chart below describes the differences among the models and can help you determine which participatory models will be most effective in specific scenarios. While there are outlier innovative projects that defy categorization, this chart displays the fundamental characteristics of each model (download a PDF version here). What kind of commitment does your institution have to community engagement? We’re commited to helping our visitors and members feel like participants with the institution. We’re commited to deep partnerships with some target communities. We’re commited to supporting the needs of target communities whose goals align with the institutional mission. We’re committed to inviting community members to feel comfortable using the institution for their own purposes. How much control do you want over the participatory process and product? A lot – we want participants to follow our rules of engagement and give us what we request. Staff will control the process, but participants’ actions will steer the direction and content of the final product. Some, but participants’ goals and preferred working styles are just as important as those of the staff. Not much – as long as participants follow our rules, they can produce what they want. How do you see the institution’s relationship with participants during the project? The institution requests content and the participants supply it, subject to institutional rules. The institution sets the project concept and plan, and then staff members work closely with participants to make it happen. The institution gives participants the tools to lead the project and then supports their activities and helps them move forward successfully. The institution gives the participants rules and resources and then lets the participants do their own thing. Who do you want to participate and what kind of commitment will you seek from participants? We want to engage as many visitors as possible, engaging them briefly in the context of a museum or online visit. We expect some people will opt in casually, but most will come with the explicit intention to participate. We seek participants who are intentionally engaged and are dedicated to seeing the project all the way through. We’d like to empower people who are ready to manage and implement their project on their own. How much staff time will you commit to managing the project and working with participants? We can manage it lightly, the way we’d maintain an interactive exhibit. But we ideally want to set it up and let it run. We will manage the process, but we’re going to set the rules of engagement based on our goals and capacity. We will give much time as it takes to make sure participants are able to accomplish their goals. As little as possible – we want to set it up and let it run on its own. What kinds of skills do you want participants to gain from their activities during the project? Creation of content, collection of data, or sharing of personal expression. Use of technological tools to support content creation and sharing. Everything supported by contributory projects, plus the ability to analyze, curate, design, and deliver completed products. Everything supported by collaborative projects, plus project conceptualization, goal-setting, and evaluation skills. None that the institution will specifically impart, except perhaps around program promotion and audience engagement. What goals do you have for how non-participating visitors will perceive the project? The project will help visitors see themselves as potential participants and see the institution as interested in their active involvement. The project will help visitors see the institution as a place dedicated to supporting and connecting with community. The project will help visitors see the institution as a community-driven place. It will also bring in new audiences connected to the participants. The project will attract new audiences who might not see the institution as a comfortable or appealing place for them. Chapters 6 through 9 provide detailed examinations of each participatory model, demonstrating how they are structured, managed, and received by visitors. But first, the rest of this chapter explores how to find the model that will work best for particular institutional goals. Understanding the types of participatory engagement possible is the first step in designing participatory projects. The next step is to find the model that will best support specific mission-related goals. For example, when Shelley Bernstein talks about her award-winning work with social media at the Brooklyn Museum, she always couches it within the institution’s fundamental mission as a community museum. Her team’s technological efforts are inspired by Director Arnold Lehman’s vision of the Brooklyn Museum as a place “based on accessibility, diversity, inclusion, and seeking out new ways to explore art so that everyone feels welcome and smart about what they’re doing.” Bernstein’s team has focused on projects that promote this vision. For example, Click! (see Chapter 3) encouraged a diverse community of photographers and visitors to feel included in creating and interpreting through both traditional and online interfaces. Arnold Lehman may not be attentive to the ins and outs of every technology initiative that comes down the pipe, but he trusts Bernstein’s ability to deliver visitor experiences that enhance the overall value of the institution. Working toward participation presents an ideal opportunity to examine your institution’s mission statement. Often there are words or phrases that provide a strong justification for becoming more participatory. You may even be able to make the argument that in order to fully pursue its mission, the institution needs to become participatory in specific ways. The Minnesota Historical Society connects people with history to help them gain perspective on their lives. The Society preserves the evidence of the past and tells the stories of Minnesota’s people. Each of these projects fulfills institutional goals to promote connections to history, preserve historical evidence, and tell the stories of Minnesota’s people. Some of these initiatives required adopting new practices at the museum, but the projects were all conceptually grounded in the core values of the institution. Speaking the language of the institutional mission helps staff members and stakeholders understand the value of participatory projects and paves the way for experiments and innovation. Educators and policy-makers define them as the skills necessary for people to be successful, productive citizens in a globally interconnected, multicultural world. Some institutions have adopted participatory learning skills as part of their commitment to overall visitor learning. For example, the Ontario Science Centre’s Weston Family Innovation Centre was specifically designed to help visitors cultivate innovation skills in line with the Canadian government’s Innovation Skills Profile. The Innovation Centre features participatory activities in which visitors can make their own objects to display and share with others, from low-tech constructions like shoes and found object sculptures to media products like stop-motion videos. In one area called the Challenge Zone, visitors work in groups using scrap materials to design potential solutions to real-world problems. These kinds of activities promote creative, collaborative forms of learning that are less available in the more traditional areas of the science center that focus on critical thinking and science content learning. Participatory learning skills don’t just apply to science centers. The Walters Art Museum in Baltimore, MD, has used the Institute for Museum and Library Services 21st Century Skills report to help plan, fund, and evaluate educational activities with its Youth Advisory Council. For example, in 2009, teenagers developed a publication called Do’s, Don’t’s, How-To’s, Why Not’s: A Zine For Teens About Museums And Art. This co-creative project showcased an alternative voice at the museum. It also helped the teens achieve target 21st century skills outcomes like critical thinking and problem solving, innovation, creativity, collaboration and communication, visual and media literacy, self-direction, productivity, accountability, leadership and responsibility. By tying the Teen Zine project to participatory learning goals, the Walters Art Museum was able to attract new funding and provide teenagers with desirable, innovative co-creative experiences. There can be tensions between participatory skill building and content learning, even in institutions familiar with skill-based activities. In the summer of 2006, 2,400 visitors to the Exploratorium in San Francisco built Nanoscape, a giant ball-and-stick sculpture meant to represent atoms and molecules on the nanoscale. Visitors enthusiastically volunteered and learned a great deal about how to collaborate on a big project and put tiny pieces together, but they didn’t necessarily learn about the nanoscience behind the project. Visitors were just as likely to describe what they were making as a “building” as they were to reference the atoms and tiny particles represented, and evaluators were dismayed at the lack of overall science learning that happened during the project. Learning Value. Visitors learn research or creative skills. Social Value. Visitors feel more connected to the institution and more confident of their ability to contribute to the institution (or project). Work Value. Visitors produce work that is useful to the institution. It’s important to keep all three of these values in mind when designing participatory experiences. There are many cases where designers, quite appropriately, develop participatory experiences that offer only a small slice of “real” work—possibly too small to really be useful. Or in other cases the work is real but simplified, with more resources required to support participants than would be needed to do the work in-house. When learning is valued as an outcome, these simplifications make sense—they allow visitors to learn new skills while making a small or slow contribution to the institution. If participants’ outputs are low or of variable value, a project can still be considered valuable for its learning and social outcomes. To do this staff had to first select a pool of objects for people to choose from. We posted a printed image of the gap, and people could play around with the different artwork choices (on laminated bits of paper) and select their choice. We also asked them to explain or justify their choice. The object with the most votes was then installed in the gap. This was hugely successful, with many people participating and commenting on how much fun it was to “be a curator.” BUT it was no longer a real project and actually required quite a bit of work from us to set up—more work than it would be for us to just choose the artwork ourselves. Goodlander’s last sentence reflects an exclusive focus on participation for useful output. Fill the Gap is indeed a “real” participatory project, but it is one that provides more social and learning value than productive work. Visitors aren’t curators or registrars. They don’t have the expertise or the time to hunt through the entire collection for the items that will physically fit into a study storage location. Goodlander’s approach—offering visitors a small set of objects from which to choose, and then focusing the activity on picking one and arguing for its inclusion—represents good design, not a fake experience. She appropriately identified the valuable visitor experience as arbitrating among objects and making an argument for a preferred one, and she designed a platform that supported those experiences. The “true value” of a participatory project is not solely determined by the amount of time and money it takes staff to do the work offered to participants. It also includes the social value of building community relationships and the educational value of providing skill-building experiences for participants. Consider the experience of cooking with a child. Under no circumstances is it easier or faster to bake a cake with an eight-year-old than to do it yourself. However, including the child builds your relationship with him, empowers him as a maker, and teaches him some basic cooking, scientific, and mathematical concepts. And it produces a cake for everyone to enjoy. For some institutions participatory techniques aren’t restricted to enhancing visitors’ experiences. They can also be applied by boards, CEOs, and management teams to increase institutions’ strategic value. Participatory projects can change an institution’s image in the eyes of local communities, increase involvement in fundraising, and make new partnership opportunities possible. Particularly for institutions that are perceived as irrelevant to community or civic life, actively soliciting engagement and contributions from citizens can make a significant impact on the health and vitality of the organization. Consider the story of the Center of Science and Industry (COSI) in Columbus, Ohio. COSI is an interactive science center that used participatory techniques to position itself with stakeholders, funders, and the public as an essential community hub of science and learning activity. We had to readdress our value proposition and start raising serious money immediately. Historically, COSI had been really focused all on attendance, and everything was skewed in that direction. But I was out there in the community raising millions, and to do that, we had to be putting forward a community-focused value proposition, demonstrating that COSI was a valuable community asset and investment. COSI partnered with researchers from The Ohio State University (OSU) to provide visitors with access to scientists and the opportunity to engage in real research. The partners co-created the Labs in Life public galleries to give visitors the opportunity to interact with real scientists working on research projects related to physiology. Scientists present educational programs about their work, which is contextualized by exhibits related to their study areas. COSI hosted OSU researchers in child development and cognition who conducted research studies with young children and their parents in the little kidspace® gallery. This started informally, but it proved so successful that COSI dedicated a room within little kidspace® for the purpose of research. OSU’s Center for Family Research (housed within COSI) has also used COSI exhibits effectively to assist in improving social dynamics for at-risk families. COSI rented 12,000 square feet of gallery space to the local public TV and radio station, WOSU, which began broadcasting and holding public programs at COSI in 2008. WOSU and COSI collaborated to host social media meetups, tech events, and other programs at the science center that brought together technologists, non-profit groups, and digital media enthusiasts. They have also hosted collaborative dialogue programs that invite community members to talk with scholars about contemporary issues related to science and religion. COSI collaborated with TechColumbus, a science and technology-based incubator for new businesses in town, to develop a new exhibition called Innovation Showcase. The exhibition features innovative work and people from local research and design companies and provides a platform for hosting events with the professional tech community. 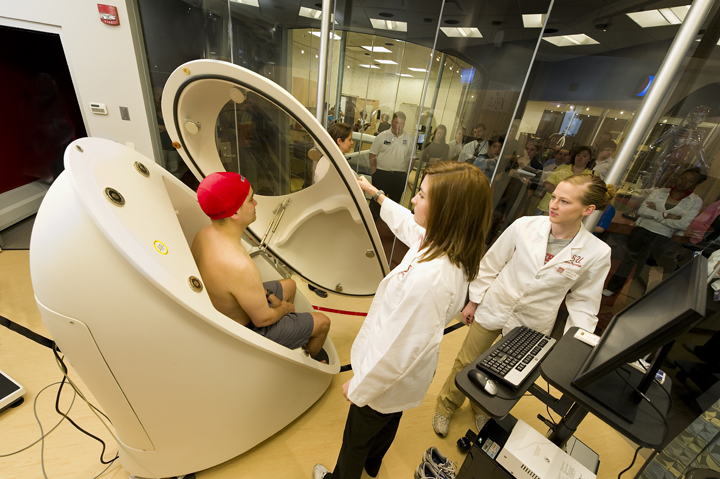 OSU researchers in the Labs in Life measure a subject’s body fat percentage and lean muscle mass in the “BodPod” while visitors look on. Photo courtesy of COSI. These activities have been incredibly successful, both in increasing general attendance and expanding the diversity of COSI visitors and participants. From 2004 to 2009 memberships increased from 11,000 to over 18,000, and as of the end of 2009 twenty percent of memberships were of the low-income “family access” type. Family access members renew at the same rates as general members, and their participation has brought COSI’s visitor demographics roughly in line with those of the county in which it is situated. A guy I met through Twitter asked me to meet in person. At first, I was skeptical because I thought he wanted to talk to me about the COSI website. When he expressed he just wanted to talk about ideas he had for COSI, we met for coffee. He pulled out this notebook with all these ideas and asked, “how can I help with the Innovation Showcase?” I was blown away. He did not want anything in return. Here I am sitting with this person who is a young professional without children, someone who would never have engaged with COSI before we got involved in social media. Now we are building a professional relationship and talk all the time about how he can help us in our social media efforts and help us reach out to the tech community. COSI used collaboration with new partners and energetic engagement with Columbus residents to turn around their position in the city. By 2009 COSI’s admission, membership, and donor numbers had all increased, despite an economic downturn. High-level donors maintained and increased their commitments to the institution, and local politicians championed COSI as an essential community resource. Rather than pursue a single participatory strategy, Chesebrough gave his staff support and encouragement to connect with the community in many different ways. Collectively they changed the value proposition of an institution that just a few years earlier was seen as “past its prime” and increasingly irrelevant to public life. Now the institution is relevant not only to its core family and school audiences but to a much wider audience of technologists, scientists, and young people. When staff members are grounded in the institutional mission and feel supported by management, they are able to creatively and confidently explore participatory techniques in ways that benefit the institution, visitors, and themselves. The following four chapters provide detailed information about how cultural institutions structure and implement the four types of participatory projects introduced at the beginning of this chapter: contributory, collaborative, co-creative, and hosted. We’ll start in Chapter 6 with contributory projects, in which visitors participate by sharing their ideas, objects, or creations with cultural institutions. This project was led by the Chicago Cultural Alliance and included the Field Museum, the Cambodian American Heritage Museum & Killing Fields Memorial, the Polish Museum of America, the Swedish American Museum Center, and the Chicago Japanese American Historical Society. Download the PPSR report here [PDF]. Download biologist Sam Droege’s highly readable overview of citizen science and its history here [PDF]. Explore the Minnesota’s Greatest Generation project here. There are many definitions of these skills. For complete lists and rubrics, consult: The Partnership for 21st Century Skills, the New Media Literacies research initiative, or the Innovation Skills Profile. Download the IMLS 21st Century Skills report here [PDF]. See Erin Wilson’s article, “Building Nanoscape,” in Visitor Voices in Museum Exhibitions, ed. McLean and Pollock (2007): 145-147. Read the February 2009 interview with Nowinsky, Chesebrough, and then-Web manager Kevin Pfefferle on the Museum 2.0 blog here.